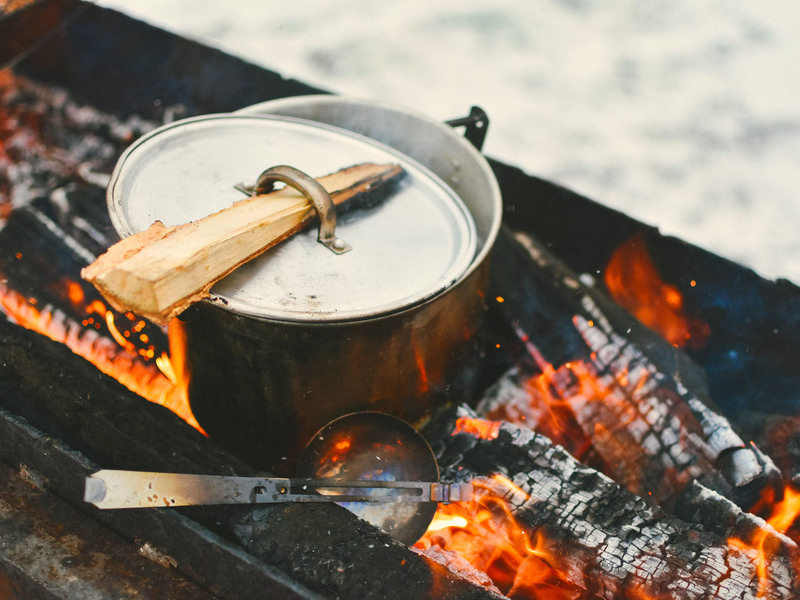 You’ve put the tent up, you’re tired and hungry, and now you want your cookware to perform. Neil Braidwood lifts the lid on some smart sets. 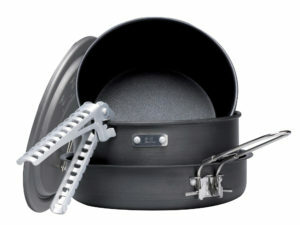 XPot cookware is collapsible, due to the sturdy silicone construction. This set suits two as it has two bowls and two generous-sized cups that all nest inside the 2.8l pot. The whole lot packs down to 45mm deep, taking up very little room in your pack. The pot itself has an aluminium base – but you do need to be careful with your flame setting, as otherwise you will melt the sides. 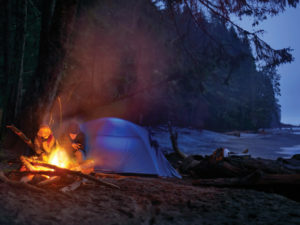 For this reason you can’t just stick the XPot on a campfire, you need to use a stove. There are moulded measuring gauges on the inside of all the receptacles, in millilitres and in cups. We cooked rice and potatoes in the large pot – and although the sides look like they might flop with too much weight in, they stay stable. The handles are also made of silicone, but have good grip (and don’t transfer any heat) when you are draining the water through the sieve on the rigid clear plastic lid. When packing away, the pot handles bend over to fasten to the lid, keeping everything together. The bowls are a decent depth, but I thought the cups were a bit wide, and hot drinks cooled quicker in them. The silicone has a tendency to stain – especially with tomato based foods, and it was tricky to clean. 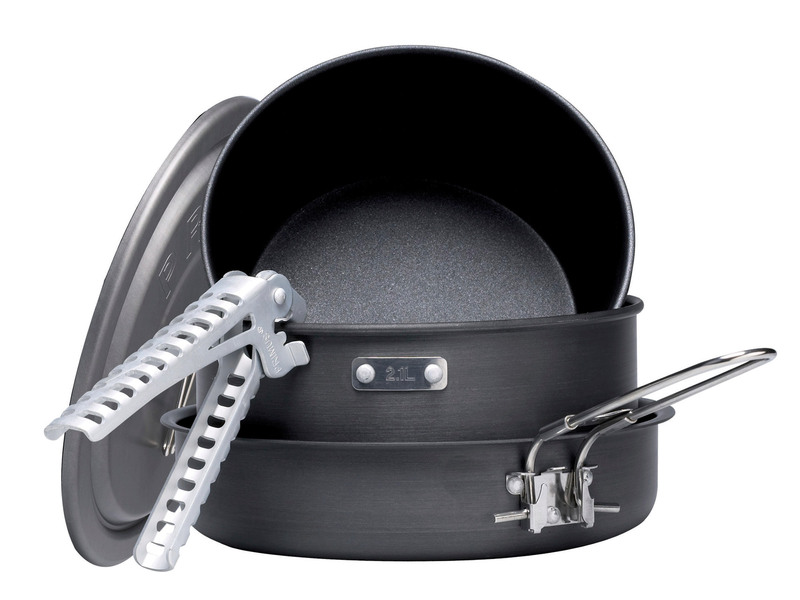 There are two pots (1.7l and 2.1l) and a frying pan in this durable anodised aluminium set. All have ridged bases, to allow for a better grip on a cooking stove. Neither pot has a handle – instead there is one separate perforated aluminium gripper that can be attached to the rim of either. The perforations dissipate any heat transferred from the pan, and Primus has even added little silicone studs so that the metal doesn’t scratch the non-stick surface. This detachable handle idea is perfect when cooking on a big fire, as the handle just doesn’t get hot – you attach when you need to stir or remove from the heat. Food pretty much slips out of the pots, and cleaning is easy. Use plastic or wooden utensils when stirring so that you don’t damage the non-stick surface. Also, it’s a good idea to use something to protect the coating when stacked, otherwise it will fail. The 21cm frying pan is a generous size and useful – after all, sausages and bacon are perfect campfire food. There is a foldable wire handle on this, and it’s deep enough to attempt a stir fry or a risotto. We managed to fit in eight sausages. It’s a shame that the one non-vented lid supplied doesn’t fit the frying pan, but it’s probably more use on one of the pots. There is a mesh drawstring bag to keep the set in. This 710ml stainless steel cooking pot contains a BPA free plastic nested cup that has a tight-fitting strainer lid. The tall, narrow pot itself is basic, and has a folding, lockable wire handle that clips over the top, keeping everything in place. 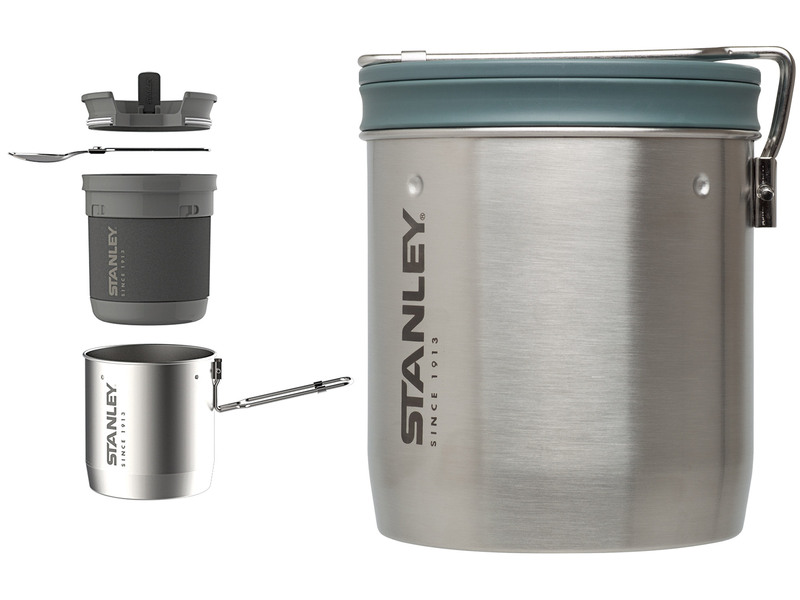 It’s perfect for boiling water or heating up an instant camping meal. Because the pot metal is quite thin, when cooking other things like soup or beans, you need to keep an eye on the heat, as the food can catch on the bottom and stick. It is taller and narrower than the other pots on test, so less stable on the stove. There are dimples on the sides to lock the cup in place when storing. The cup and pot both have markings on the sides (ml and oz), but the ones in the cup are tricky to read. 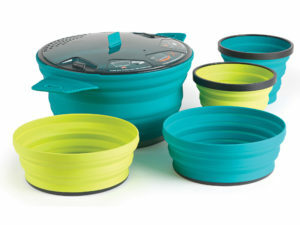 A neoprene sleeve around the cup keeps food warm and your hands protected, and it’s removable when you need to wash up. I forgot, and neoprene doesn’t dry quickly. Also supplied is a stainless steel folding spork – which is full size. You can also fit a 100g gas canister within the cup, which is handy. Consisting of one 1.8l hard anodised aluminium Teflon coated pot – there are four bowls that nest inside. 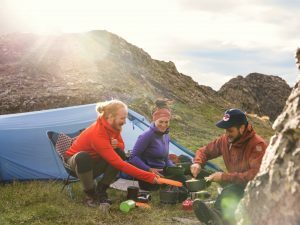 With a bit of clever packing you can fit in a gas canister and burner too, and the whole lot fits into a drawstring waterproof stuff sac that doubles as a washing up bowl. The pot has a foldable, insulated wire handle which snaps over the top to keep all the elements in place. Two of the bowls are insulated with neoprene, and have sip through lids. Rather than sporks, GSI choose to call their version a ‘foon’, but essentially they are extendable plastic sporks. I found them a bit small and fragile and I wouldn’t expect them to last very long. The design is clean and modern, and is pretty compact. The pot lid has a vent and strainer, and an insulated handle for removal while cooking. This set from Scottish outdoor company Highlander is pretty good value for four pots and four plastic bowls that all nest inside a mesh bag. There are two frying pans – which seems a bit much, as they are almost the same size (17cm and 15cm). I suppose you could split the set if you were just going away on your own. 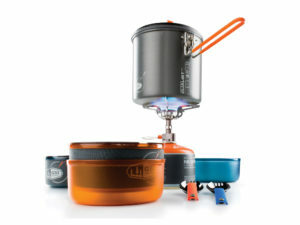 This set lends itself more to car camping when you might have a larger cooker (with two burners), and could create more elaborate meals. 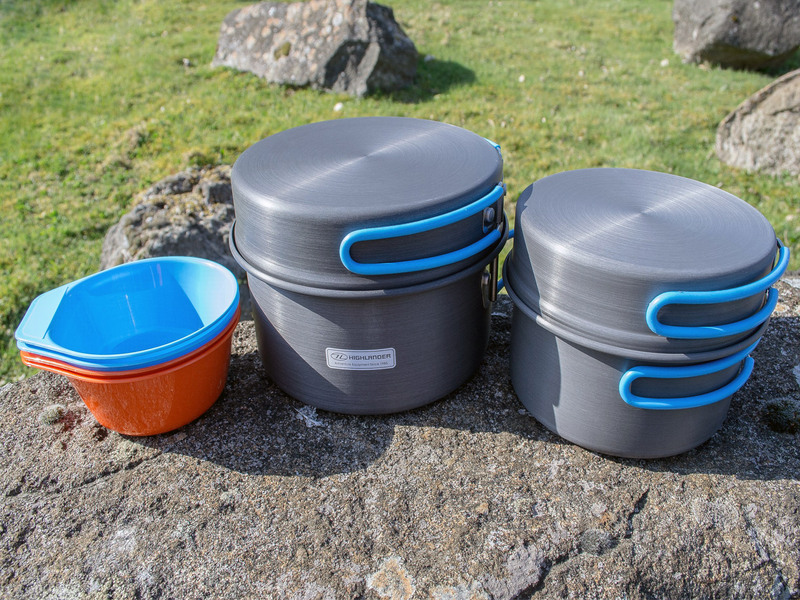 All the pans are made from hard anodised aluminium, with silicone covered wire handles, which are quite effective at reducing the heat, but couldn’t be used on a campfire as they would melt. There is a 1.7l and a 1.9l pan – but no lids – so if you are cooking potatoes, say, the cooking time is lengthened. There are four plastic bowls, which are pretty small – my breakfast of two Weetabix wouldn’t fit in unless broken up, but I suppose you can always have seconds. There are measurements marked on the sides of the bowls, in ounces only. Although not a cooking kit, I thought I should include this well designed picnic set from Swedish company, Light My Fire. 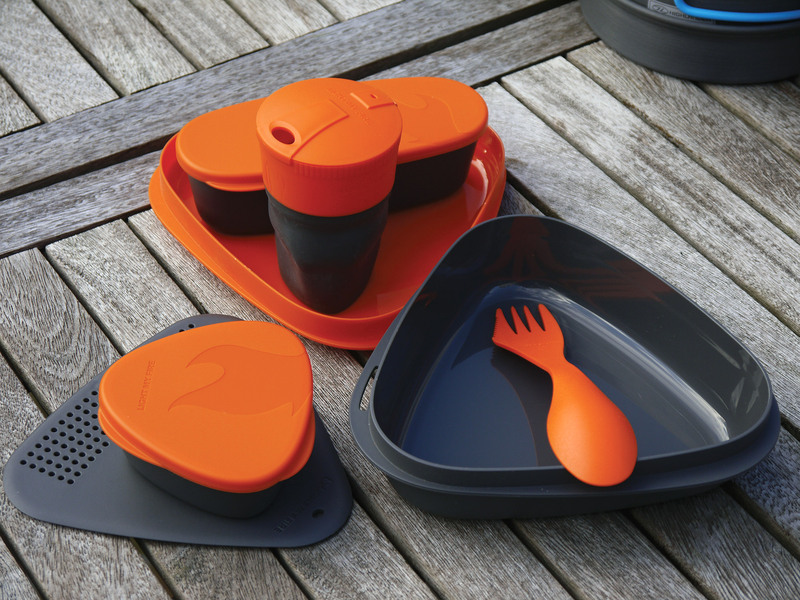 Made from polypropylene, it consists of a plate, bowl, collapsible cup with (almost invisible) measuring lines, two containers with lids, a chopping board/strainer and spork. The whole lot packs together well, and is held by a rubber harness. Perfect for solo travelling, or take one each (it comes in loads of different colours) if you are a family. The plate and bowl are a generous size, but the containers are on the small side. I packed a lunch-sized portion of pasta in the larger one, and some yoghurt in the smaller one – but then just ate straight out of them. The lids snap on securely, so there were no leaks, and the whole lot is dishwasher proof, so you can pack it all back together and bring it home to clean. I suppose you could use the containers for ingredients for your meal – sausages or beans or similar – and they are available to buy separately, so you could take along more, though they wouldn’t stack into the set. On the subject of packing – it’s a bit of a puzzle – so a good idea to take a picture of how it all fits together. I love the chopping board – it’s big enough to chop an onion on, but not quite big enough as a breadboard. The cup too, is a clever design, having a rigid top with sip-through lid, with a silicone lower part which stuffs into the top to save space.